Keeping production strictly on schedule in any facet of the food and beverage industry, whether it be pumps, conveyors or electrical connections, means downtime is not an option. Comtest advocates including infrared inspections (IR) into the maintenance mix. Its range of high performance, thermal imagers makes year-round spot-testing possible, onsite, specifically troubleshooting and monitoring transformers, switches, disconnects and MCCs; pumps, motors and compressors; valve operation; tank and sludge levels; level control performance; pipe blockages and integrity; operating temperature; conveyors and roller bearings; boilers and chillers; HVAC, and roof moisture, air leaks and insulation issues. By performing quick infrared spot checks, maintenance technicians can uncover potential failures, thus allowing for timeous, repairs when convenient. Thus the line can be kept moving through frequent scanning and troubleshooting of critical equipment. Traditional troubleshooting using trial and error can be effective, but time consuming and costly. What is critically important is to be able to pinpoint an issue within a mass of sprawling production lines, quickly, because downtime is expensive. Equipment cost has historically forced plant managers to outsource annual infrared inspections, and in many cases, limit the scope of work. Annual scans certainly uncover problems, but users should not have to ‘hope for the best’ until next year’s scan. 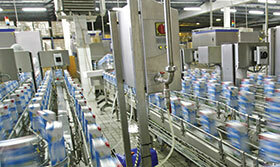 Food and beverage production demands reliability, so yearly spot checks are no longer enough. Regular production line monitoring can narrow down and rule out possible problem causes faster by picturing the situation in infrared, allowing the varying temperatures of components to ‘tell the inside story’. 1. Ensure consistent frequency: infrared inspections of all major components and connections should be performed at least bi-annually. 2. Adjust for ­emissivity: components and materials emit energy differently. For accurate findings, ensure that the proper emissivity setting is being used for the material that is being inspected. Also, consider altering the surface by adding tape or paint to increase emissivity. 3. Perform qualitative measurements: compare findings with similar components and connections under similar conditions to reveal thermal anomalies. 4. Ensure safety during inspection: beyond electrical safety, be careful not to neglect the surroundings while performing infrared inspections. Focusing too heavily on the thermal imager can distract the personnel from rotating, cutting, or other dangerous equipment.